Canyon Lake High School Senior Kenzy Hoffmann saw an opportunity to share her passion for showing livestock animals four years ago, and the result is an annual event that brings smiles to all who participate and volunteer. In fact, the 3rd Annual Special Hearts Livestock Show is scheduled for Sunday, Dec. 2, at the Comal County Fair Grounds with 25 special needs students participating and more than 40 volunteers. 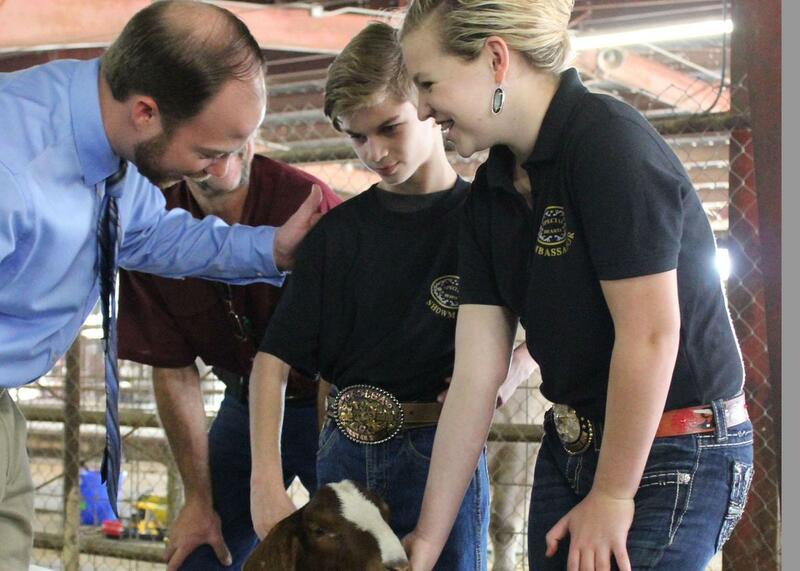 Four years ago, as a freshman at CLHS, Hoffmann shared a program idea with her friend, Miranda Horak, which would allow special needs students in the Comal Independent School District the opportunity to show livestock animals. Horak’s brother, Rylee, who is currently a sixth grader at Mountain Valley Middle School, was the first special hearts exhibitor. At the time, Hoffman had just become a Texas 4-H Livestock Ambassador and had volunteered for a special needs livestock show in San Angelo. She knew immediately she needed to start one in her own backyard, and with the help of Horak, the first Special Hearts Livestock Show took place in the fall of 2016. Horak currently attends Tarleton State University and is a 2017 graduate of CLHS. “I was shocked at how many kids wanted to be a part of it,” recalls Hoffman, who is currently serving as the Comal 4-H Council president. The following year, a petting zoo was added. Participants range from third grade to high school seniors. “The idea is to introduce special needs students to an animal or livestock,” the show’s founder continues. Initially, participants are introduced to an animal, generally a sheep or goat, by a volunteer who has livestock show experience. “They are usually a little scared at first, but it helps them to be a part of something,” says Hoffman who has been a member of Comal County 4-H her whole life and enjoys sharing her passion with others. Every participant has a picture taken with his animal and goes home with a t-shirt from the event. Of course part of every livestock show is presenting the animal in front of a judge. Participants at the Special Hearts Show are given some time to get to know their animal and learn how to show it in front of a judge before they lead it into the arena just like any other livestock show. A judge walks around the animals inside the arena and asks participants questions about the animal they are showing. It’s an experience like no other for these kids, and their smiles speak louder than words. This year’s sponsors include Hoffmann Floors, Rush Enterprises, Bluebonnet Dodge, Latuya Construction, Epic Books, the Lanthum Family, Canyon Lake FFA, Canyon New Braunfels FFA Booster Club, H-E-B and Yaws Construction.